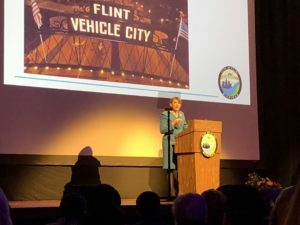 Mayor Karen Weaver delivered the State of the City address from the Capitol Theatre in October 2018. Democratic Convention in July 2004. By the time her speech ended, her supporters were ready to bear arms and march into battle to assure her re-election. Mayor Weaver was, of course, referring to the fact she called a State of Emergency as a result of Flint’s ongoing water crisis although many told her it was not the right thing to do, and that the most the city could expect to gain was $5 million from the Feds. As a result of Weaver giving voice to the water crisis, the city has raked in over $500 million in the past three years. “Can these dry bones live again,” Mayor Weaver asked. Mayor Weaver touted the $3 million grant from the Kellogg Foundation to restart the city’s economic development department, the 21,000 homes her Fast Start program has checked to determine whether or not lead lines had to be changed, and the 2,000 new jobs that have been created since becoming Mayor. “Can these dry bones live,” she asked. “Yes, they can,” she answered. 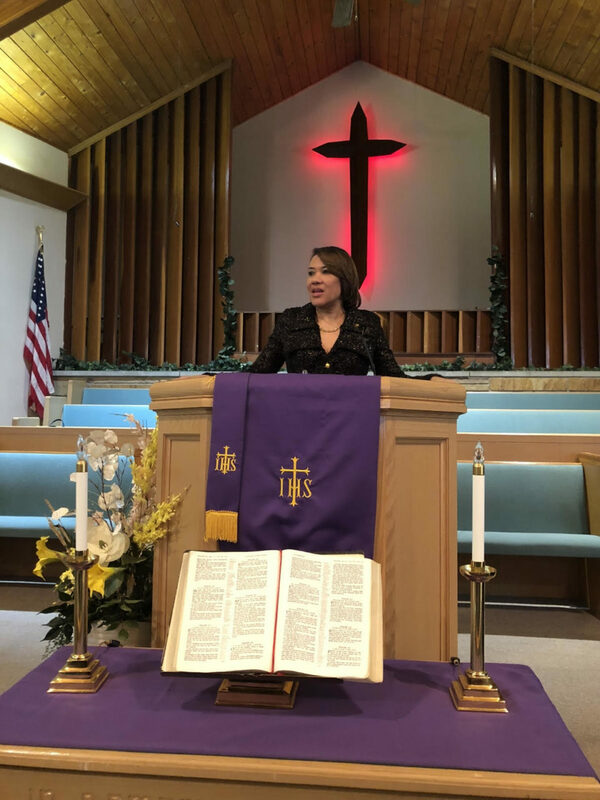 The smoothly ran program was moved along by Sharinese Jackson, Pastor of Quinn Chapel AME Church. Others on the program included Lawrence E. Moon, President of L.E. Moon Funeral Home, Lamarr Griggs, Pastor of Second Chance COGIC, Samuel Berry III, Pastor of Macedonia Baptist Church, Bishop Neal Roberson, Pastor of Church of the Harvest, Chia Morgan, representing millennials, Dr. Reginald Flynn, Pastor of Foss Avenue Baptist Church, longtime friend and former teacher, Dr. Gail Ganakas, and Larry Roehrig, President of AFSCME Council 25, who introduced the Mayor in a manner that only Larry Roehrig can.